The task at hand was enough to make even the most self-assured songwriter wither in excruciating insecurity: Set to music assorted lyrics and poetry by Bob Dylan from 1967 — a box of the music legend’s handwritten texts dating back to his infamous refuge with The Band in Saugerties, New York had at long last been unearthed — and record the songs for a new album. 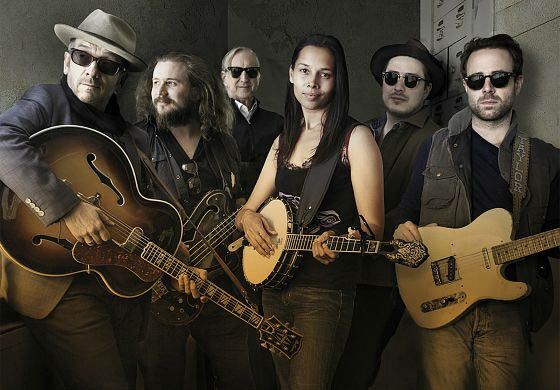 Lost Songs: The Basement Tapes Continued tells the story. Directed by Sam Jones, the documentary (which premiered late last year on Showtime and is now available on DVD and Blu-ray from Eagle Rock Entertainment) chronicles and contextualizes the making of the 2014 LP, Lost on the River: The New Basement Tapes, for which producer T-Bone Burnett recruited a select group of artists — Taylor Goldsmith (Dawes), Marcus Mumford (Mumford & Sons), Jim James (My Morning Jacket), Rhiannon Giddens, and Elvis Costello — to rise to the challenge. 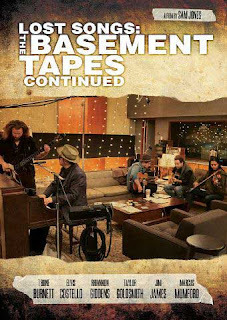 The backstory of The Basement Tapes is adeptly underscored throughout, not least of all with new and incisive commentary from Bob Dylan himself, whose reflections overshadow the documentary’s narrative much like his songwriting overshadows the efforts these musicians are shown to make in composing music to his words. Indeed, what begins as a relatively informal songwriting workshop in due course evolves into an intense, often intimidating endeavor as everyone involved at some point finds their talents being tested beyond their comfort zones. The very idea of making an album that in any way shares some piece of history or perspective with one of rock ‘n’ roll’s most mythologized episodes had to have thrown them all for a mind-boggling loop on some level. Even Burnett, whose own storied career includes a stint as guitarist on Dylan’s 1975 Rolling Thunder Revue, acknowledges the surrealism at play. Whether the songs these artists brought to life compare to the insouciant, never-intended-for-release performances on The Basement Tapes is beside the point, really. The album has more than enough highlights — particularly from Giddens (“Lost on the River #20”) and James (“Down on the Bottom”) — to stand on its own. That, in the end, is what this film illustrates and affirms the most.